The first 14 days of March, I participated in my first Instagram yoga challenge, despite doing yoga for 13 years and teaching for 9. I had stayed away from doing openly visible things with my yoga practice and body. What if I’m just showing off? What if I’m not good enough at my practice to be posting photos of me doing yoga? I can be notoriously lazy (I can’t do online classes more than one session for that very reason), so would I even finish the whole thing? And if I didn’t, there would be evidence on my instagram account that I didn’t finish what I started! But I’ve always been intrigued by the yoga posts, I’d see both my friends in the yoga world posting as well as random Instagram posts I’ve seen over the years. I decided to try. Yay me for having a sense of adventure! 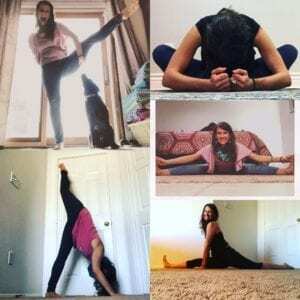 I really appreciated the challenge that I selected with Do You Yoga and Katy Scherer Yoga for the “Get your Splits on” Instagram Challenge, known in Instagram circles as #getyoursplitson. The poses that were selected were very accessible. Even a beginner could do most of them as well as each pose built upon the previous, that it wasn’t diving straight into the complicated ones immediately, but more of a 14 day long warm up. Most days I worked up to the pose of the day, starting with the previous poses. I was usually raring with energy for the practice and photo shoots. A few days I felt like I had no energy until I got on the mat and it energized me. There was only one day where I was “just TOO tired” but as grace would have it, it was baddha konasana, a more of a relaxing/restorative pose. I enjoyed looking and liking and commenting on complete strangers posts who were also doing the challenge, giving a feel that distance really didn’t matter. I had fun with staging some of the photos, especially those that had dogs in them. And the only pose I was worried about, Birds of Paradise was fun and goofy to do, that the “mistake” one was more fun and had a happy vibe more than the one with the full on bind. I’m so glad I did this fun challenge. Will I do one again? I’d like to and I probably will. I appreciated the sense of accountability, that I “had” to post a photo every day, and be appropriately warmed up for the more intense photos. Thanks to those of you who watched me on this journey in Instagram yoga challenges!